Two conditions often precede market trend reversals: extremes and divergences. 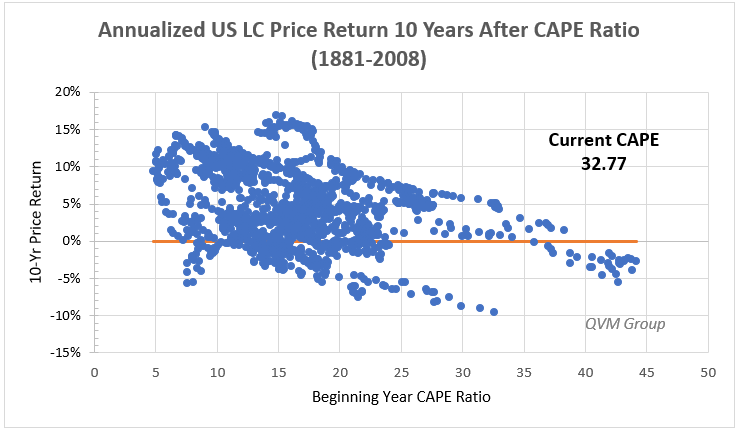 S&P 500 may have difficulty achieving a 10-year annualized nominal 5% return. 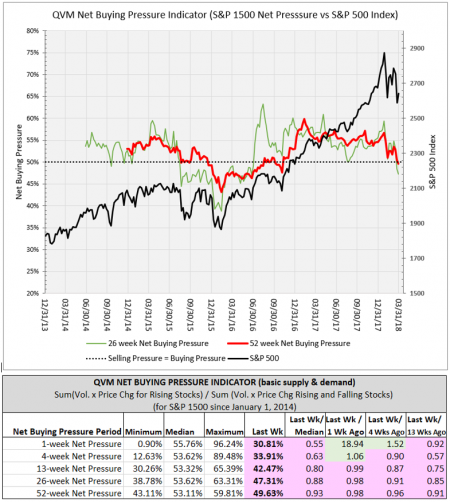 Buying Pressure is now less than 1/2 of combined Buying Pressure and Selling Pressure, after many months of decline. Two conditions that often precede market trend reversals are extremes and divergences. Extreme conditions tend to revert toward median levels, and divergence between functionally linked dimensions is unnatural, and tends to cause them to adjust until they are generally aligned again. There are significant current extremes and divergences in US stocks that provide reason for caution and expectation of continuation of the current Correction. Extremes and divergences are the setups, but they need something to cause investors to change their outlook and trigger the trend reversal — often a surprise or shock from outside of the stock market, but we don’t know what, when, where or how great they will be — otherwise they would not be surprises or shocks. We can, however, measure how far the rubber band is stretched – how extreme a condition is, or how large a divergence is between related dimensions. The more the rubber band is stretched, the more likely is it to break, or how hard it will snap back to its normal shape when the force stretching it lets go. The Shiller CAPE Ratio is also popular. It is the price divided by the inflation adjusted 10-year average earnings of the S&P 500 (meant to capture a business cycle, not just a single year somewhere within a cycle). The picture is worse for price appreciation prospects. 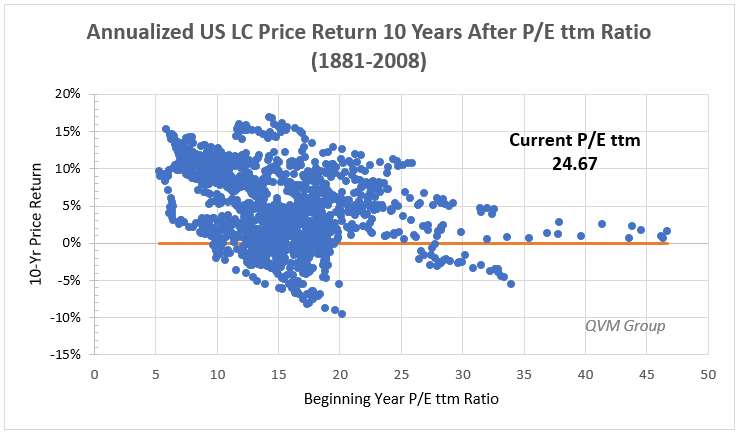 A 5% nominal return is not likely and the potential for a negative return is higher than when considering the traditional 12-month trailing P/E. 40.67% change to median: net price rise by 12%, 1.18% annualized return. There are some important breadth divergences now that deserve attention (as of 03/30/2018). 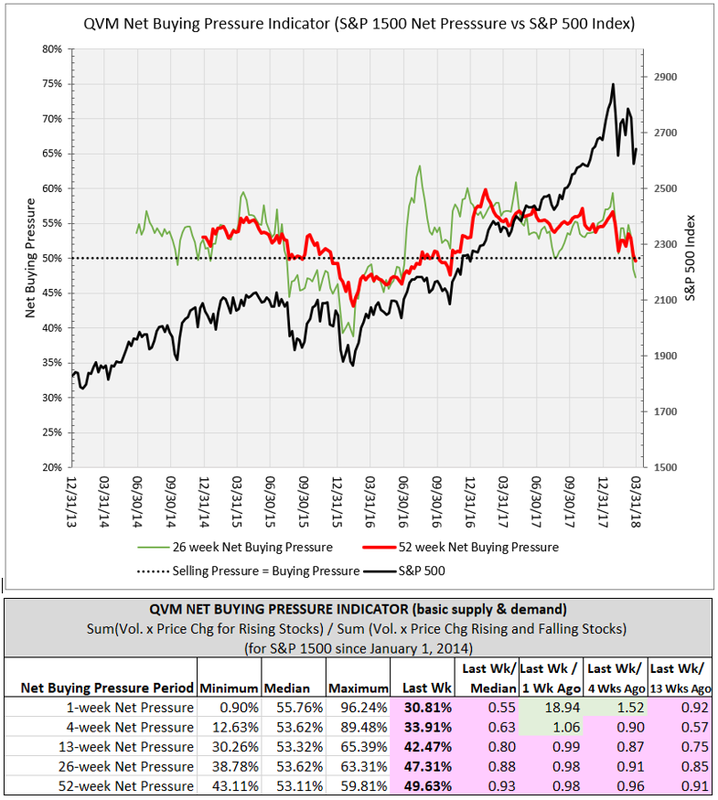 Net Buying Pressure is less than 50% (= Net Selling), as this chart illustrates. This is not a value indicator like those we just discussed. It is trend indicator. The Buying Pressure has been deteriorating for many months, while the price of the index was rising – a key divergence. The index is in Correction which is in alignment with the Pressure. We need to see Buying Pressure turning up before the index can be expected to exit Correction. 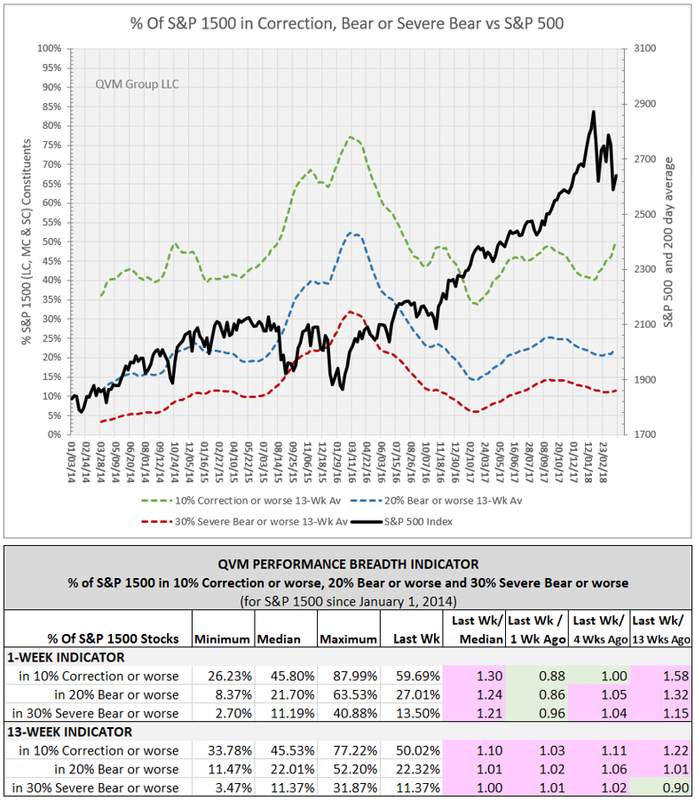 S&P 1500 Constituents in Correction, Bear or Severe Bear have been above the 4+ year median but were improving until the current Correction. 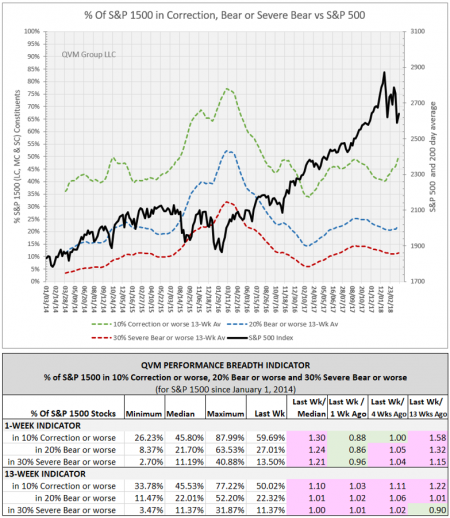 The percentage of constituents in Correction is in harmony with the index Correction, and the Bear and Severe Bear levels are beginning to harmonize. We will want to see these indicators turn back down for any recovery in the index price to be believable. The press has made the position of the price versus the 200-day average a popular indicator of Bullish or Bearish conditions; and to a more limited extent popularized the direction of the leading edge of the 200-day average. Here is where they stand as of the end of market today (04-02-2018). With 40% to 45% of stocks showing a downward sloping tip to their 200-day trendline, and more than half with prices below the trendline; and 45% to 50% with the price below the 200-day trendline for at least 3 days, the Correction is still firmly entrenched. Typically, in Bull markets, analysts reduce their earnings forecasts as the quarter proceeds. During the last 20 quarters they reduced their estimates on average by 3.9%, and by 5.5% during the last 40 quarters, and by 4.1% over the last 60 quarters. However, in Q1 of this year, they increased their forecasts by 5.4%; the largest increase in any quarter since FactSet began tracking the changes in 2002. The previous largest increase was 4.8% in 2004, an early Bull market recovery period. At the same time, they raised estimates, the stock market has been in correction – an interesting divergence. Our client managed and advised portfolios have widely varying allocations, because they are customized, and the clients have widely varying ages, wealth, withdrawal needs, other income, and other assets; including private funds, venture capital and direct real estate ownership and development. Of the marketable assets we hold or advise for them, the OWN allocation ranges from 100% to about 50%. LOAN allocations range from 0% to about 35%, with various combination in between. Current general advice for those who have completed all or most of their accumulations is to have an OWN allocation at or near the bottom of their policy range, to have LOAN allocation at the bottom of their policy range, and to focus on quality credit and variable rates; and to hold the balance in RESERVE until the current Correction shows credible evidence of recovery. This entry was posted on Monday, April 2nd, 2018 at 11:00 PM and is filed under market conditons, market outlook. You can follow any responses to this entry through the RSS 2.0 feed. Both comments and pings are currently closed.